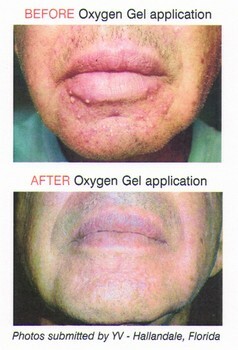 What is CellFood Oxygen Gel? 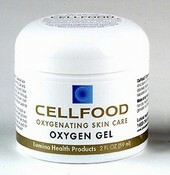 Cellfood Oxygen Gel is specially formulated to take advantage of the dramatic topical benefits of Cellfood. Our formulators have utilized specific high quality ingredients—each one known to be an exceptional skin rejuvenator— to create a skin gel that is both beautifying and healing. Cellfood Oxygen Gel contains Aloe Vera, Cellfood [ a proprietary ionic blend of 78 minerals, 34 enzymes, 17 amino acids, elctrolites & dissolved oxygen ], Lavender Blossom extract, Glycerine (Kosher), polysaccaride gum, and Dehydroacetic Acid. Not tested on animals - Fragrance-free - Hypo-allergenic - Paraben-free. For persistent conditions: You may add 1 or 2 drops of original Cellfood concentrate to the Oxygen Gel for special skin problems. Don't add it to the jar— rather, mix a drop or two into an individual application of Gel. You may use the cap for mixing. Gel will become more liquified, and will penetrate your skin's cellular tissue with enhanced oxygenating power.